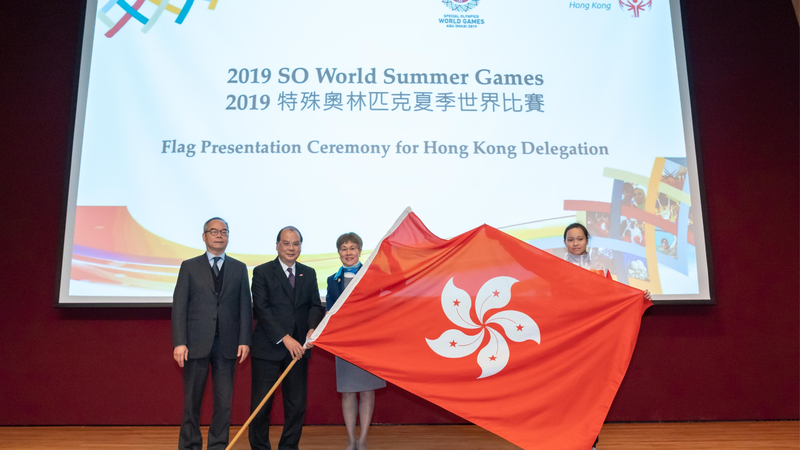 Acting Chief Executive of the Hong Kong Special Administrative Region, Mr Matthew Cheung Kin Chung, GBM, GBS, JP was the guest of honour at a flag presentation ceremony held on Tuesday, 22 January for the Hong Kong delegation to the 2019 Special Olympics World Summer Games. Mr Cheung presented the HKSAR flag to the delegation representative at the ceremony at Hong Kong Sports Institute, and was joined by Honorary Head of Delegation, Mr David Ip, BBS, BH; Head of Delegation, Mrs Laura Ling, BBS, MH; Deputy Head of Delegation, Mr Yeung Tak Wah, MH, JP; and Deputy Head of Delegation, Dr Evelyn Lam, who showed their support for the athletes. 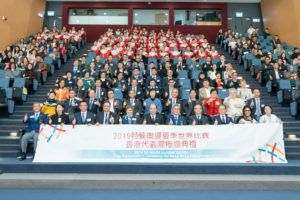 Taking place in Abu Dhabi, UAE, from 8 March to 21 March 2019, the Special Olympics World Summer Games will see a 103-member delegation (62 athletes, 21 coaches, 10 unified partners, 9 team officials and 1 medical personnel) flying the flag for Hong Kong across 10 athletic events. At the flag presentation ceremony, Mr. Cheung presented the HKSAR flag to delegation and athlete representatives, sending his blessings and support. “We can always see the spirit of bravery and perseverance in our athletes. In recent years, they have been continuously gaining success from different world games and had never disappointed the crowd. I believe that our athletes will definitely try their best and fight for Hong Kong in 2019 Special Olympics World Summer Games,” said Mr Cheung. “Special Olympics Hong Kong has always provided opportunities for people with intellectual disabilities in Hong Kong to participate in a variety of different sports. It is through sports that we hope they can integrate into society while building their courage and self-esteem. All athletes who participate in the Special Olympics World Summer Games have gone through rigorous training regimens. Since the first time we participated in 1995, SOHK have won 615 medals in the summer world games. We hope the 62 athletes participating this year can continue this success and win additional medals for Hong Kong, but more importantly, to enjoy the Games,” said Mrs Laura Ling, Head of Delegation. Kwok Hak Yin, an athlete representing SOHK, shared his experiences with the audience. “Since I’ve started participating in the Special Olympics years ago, I started training on a regular basis. Through my training and participating in different competitions, I have gradually built up my self-confidence and became more outgoing and comfortable with interacting with others. Now, whenever I encounter difficulties or challenges, I face them head-on with courage.” This is Kwok’s first time participating in the Special Olympics World Games. 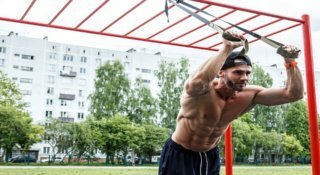 In 2017, he won two silver medals and one bronze medal in the track and field events in Hong Kong. He has additional international competition experience in distance running, track and field, and cross-country running. He was awarded second place at the 3km Challenge Group, teens group (M1) at Tung Wah Group of Hospitals’ iRun event. In addition to his athletic pursuits, Kwok also participates in various community events through preparing and leading leadership training sessions for athletes. SOHK is grateful for all their sponsors and Hong Kong Disciplined Services who support the torch run fundraiser, particularly the Por Yen Charitable Foundation, which has donated HKD800,000 in support of the athletes. Dr Evelyn Lam, the Director and Chief Executive Officer of Por Yen Charitable Foundation, also serves as Deputy Head of Delegation, supporting each athlete to ensure they live a fruitful and fulfilling life. For more information on the Special Olympics, please head to www.specialolympics.org. 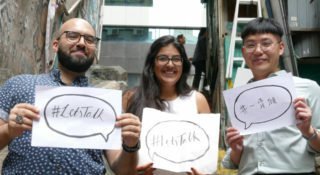 The new findings, unveiled on World Mental Health Day, present a confronting look into attitudes toward mental health in the city. Arnold Schwarzenegger’s multi-sport celebration is partnering with Sinclair for its Asia debut. 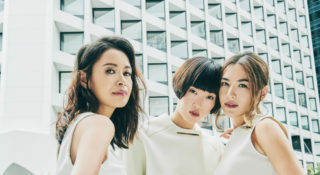 LUXARITY returns to Hong Kong this November, with a unique shopping experience driven by curated luxury goods, sustainability and blockchain innovation.